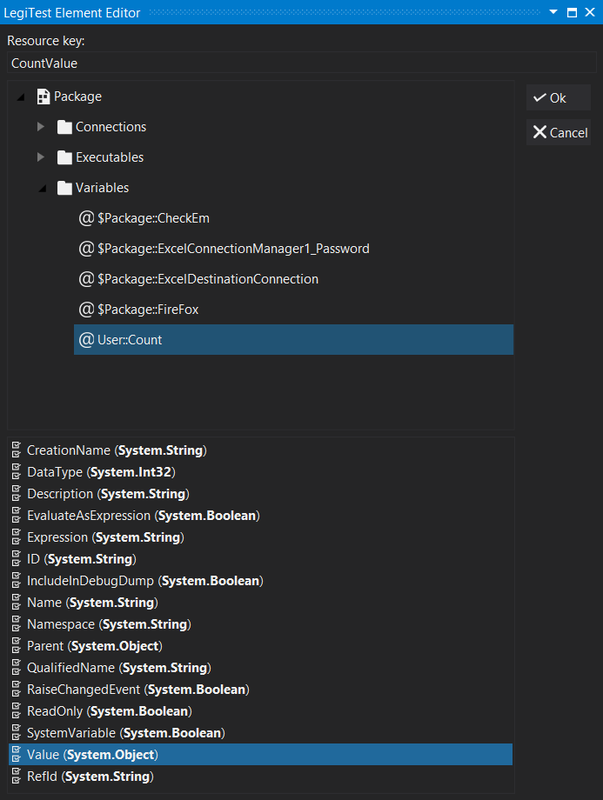 The SSIS actions allow testing of packages, their properties, and their tasks. 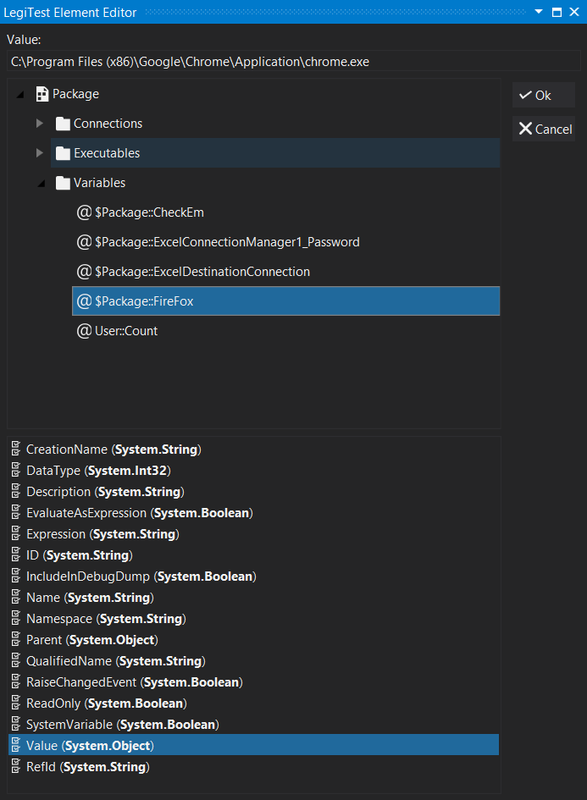 A package can be loaded from a package reference asset and then used to get its properties, set its properties, or select individual tasks to execute. The Execute Package action allows launches a package from the test. Decide if the test fails on package failure or continues. Fail On Package Failure Toggle on or off to determine the behavior of the test on package failure. Package The resource key of the package you want to execute. Resource Key The result of the package is placed in the resource key. 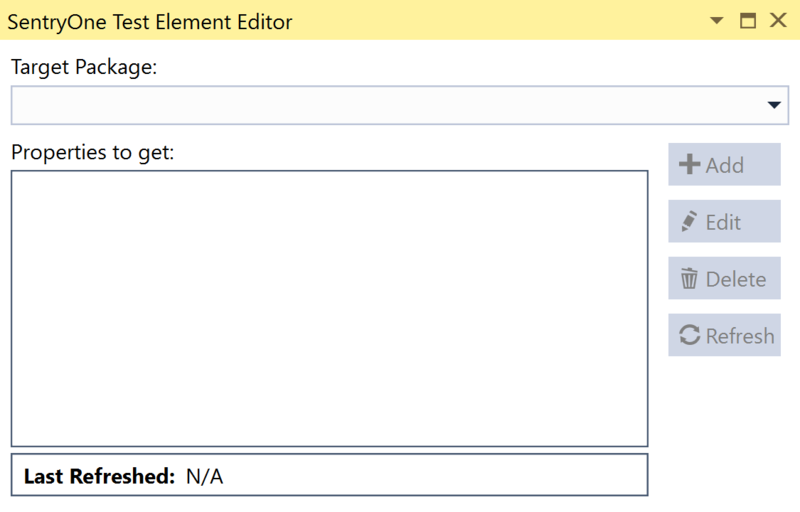 The Execute Task action is used together with a Package Reference and Load Package element. Select the task you wish to execute when the test runs. Target Package The resource key of the package that's used from a previous load package action. Resource Key The resource key that stores the result of the package. Fail on task failure Specifies whether or not to fail the test if the task being executed fails. Package Selection Window A list of available tasks from the chosen package are selectable here. The Get Properties action gets the properties of various items of a package. For example, getting the value of a variable, or getting the type of a parameter or variable. Target Package The package reference key from the previous load package action. Properties to get A list of properties to retrieve when this action runs. Add Select Add to open the Add Property window. Select the package, the object, and then the property in the Add Property window. The value of the property can be set to a resource key defined at the top of the editor. Edit Select Edit to open the Add screen with the selected property in focus. Delete Deletes the selected property from the get list. Example: In this image, the data type of the count variable is being retrieved and stored in the resource bag with the key CountValue. The Load Package action prepares a package from a package reference asset and gives it a resource key to use in another element. Package Reference Asset The package asset previously defined. Resource Key The location where the package is stored. This is used to select the package in the execute package element. The Set Properties actions sets the properties of a package during the test run. Set multiple properties using just the one element. The reference key of the package to use. The list of properties added to the element you want to set. Opens the Add Property window where you select the property to change. 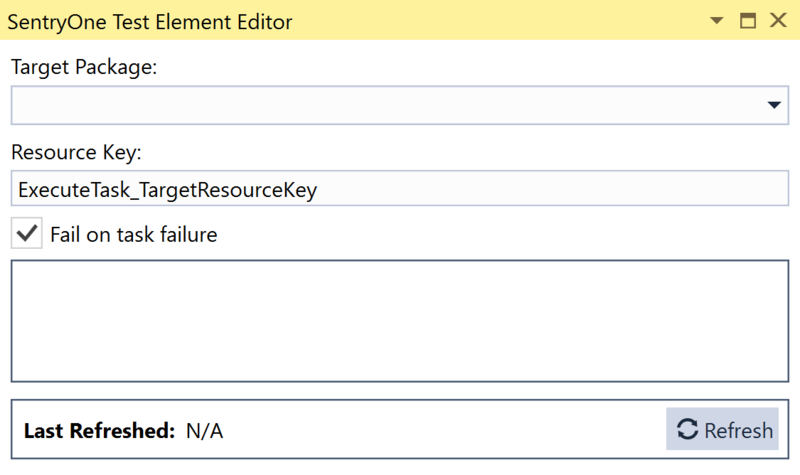 Opens the Add Property window with the focus on the selected property. 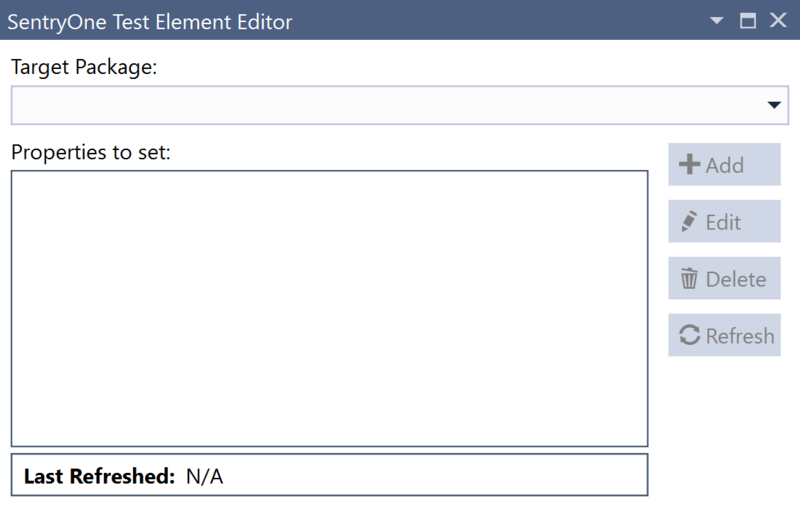 Deletes the selected property from the set editor. In this image the variable @User::Count is having its value set to 23456.